Have you ever had that moment of panic when someone shows up at your door unexpectedly? You invite the guest in- while your eyes and hands move quickly to remove any personal or slightly embarrassing items that may be commented on. You catch the dirty laundry basket in the corner, waiting for the perfect moment to slide it away secretly. You remember the dishes you were meant to clean…two hours ago. What if your guest is someone you you’re rather close to? You can be sure that a parent will always have something to say inside your unfiltered home. As a young adult who still lives at home, I admit I recoil at the thought of my mom going through my personal stuff. My mother is not afraid to waltz into my room and start picking things up and digging through my closet. You want to put on the appearance that you’ve got everything handled, when in reality you’ve fallen, and are struggling to stay on top of responsibilities. I’m willing to bet that this is how it feels when God rushes into our messy lives. We’re so used to maintaining our version of an “organized chaos” that we are on guard when someone tries to dip their hands into our business. We hold on tightly to our personal belongings (materials, comforts, sins), negotiating with God to keep some things, and nudging him away from touching others. But like a parent, God rushes in with great love, on His timing, and with the intention to rid the space of things that we don’t need. Things that will cause bigger problems if left untouched. Times passes and that “spring cleaning” reminder has crawled into the winter season, still unchecked. We tell God to help us with our messes, but we still want it cleaned our way. 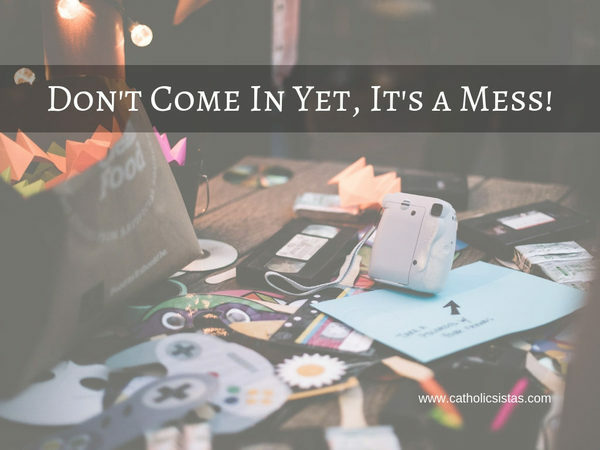 “Lord, throw these things out for me, but let me keep this.” Or “Lord, I’m not ready to give this away yet.” The Lord wants more than our full attention–He wants our surrender and our willingness to give up the mess so that he can do the rest. I’ll admit, it doesn’t feel all that great when you have someone rummaging through your things without warning. Especially if they are things that you avoided. Sometimes God brings things from the past that you buried long ago. And sisters, it hurts to see those things, it really does. But these things are a part of His process. So your life will feel disturbed, shaken and complicated. But you can trust that it’s a sign God is rummaging through your room. He’s finding the hurts and the joys that you hoarded for years, and he’s taking you back through those journeys. He’s throwing out the things you thought you couldn’t live without, and dusting off the things you took for granted. He’s looking under your bed for your biggest fears and He’s shining a light on them so that you can finally sleep at night. He’s polishing your windows so that you can see the world clearly again. But he said to me, “My grace is sufficient for you, for my power is made perfect in weakness.” Therefore I will boast all the more gladly about my weaknesses, so that Christ’s power may rest on me (2 Corinthians 12:9). Sanctification takes a bit of shaking and shattering. We can’t expect the Lord to come into our lives and rebuild a home if we’re still holding on to the broken parts. To our comforts and our worldly desires. True sacrifice is when we surrender the things we value the most. So next time you hear a knock on your door, perhaps it’s not house, but Heaven-keeping.